Let us know why and help us focus on your needs. 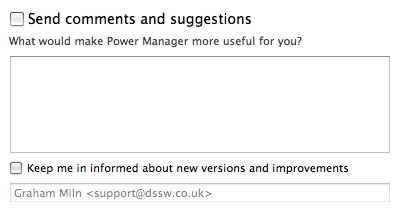 Power Manager 3.7.1 provides an easy way for you get in touch and tell us what we could do to better. 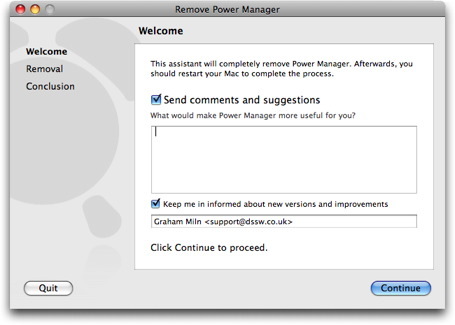 Power Manager's new removal assistant includes a screen for sending us comments and suggestions. You can also request to be e-mailed when new versions of Power Manager are released — maybe the next version will entice you into joining us. Identifier of the removal tool used i.e. uk.co.dssw.powermanager.remove. You can choose not to send us any feedback by unchecking both the check boxes. Nothing will be sent and no contact will be made with DssW if both these boxes are unchecked. If you do send us comments, feedback, or suggestions, please consider including your name and e-mail details. We read everything you send and, were possible, we will contact those we think we can help. This article was posted in Power Manager and tagged dssw, feedback, Power Manager, and trial.